Cambridge Timber Buildings have gained a reputation in Cambridge, Cambridgeshire and throughout the UK for providing exceptional quality Garden Buildings. We have a range of quality Garden Rooms, Garden Studios, Garden Offices, Summerhouses, Workshops & Garden Sheds. Our experts are experienced and knowledgeable in designing, manufacturing and installing timber Garden Buildings to your specific requirements. Whether you are looking for quality Garden Rooms, Garden Studios, Garden Offices, Summerhouses, Workshops or Garden Sheds; we can provide them all. Using our 5 step process we offer a fully bespoke service allowing you as the customer to turn your vision into a reality. Through combining high quality craftsmanship with the latest state of the art equipment at our Cambridge facility, we are able to provide each customer with bespoke Quality Garden Buildings which are built to your exact requirements and finished to an exquisite standard. All of our Garden Buildings are built by hand in our workshop just outside the beautiful city of Cambridge. Our craftsmen pride themselves in producing first class workmanship so that all our Quality Garden Buildings reach our customers in the superior standard that we set within our industry. You can rest assured that we are recognised throughout the industry for providing an excellent level of service from the initial consultation, through to the final delivery and installation of your bespoke garden building. We are perfectly situated to provide a nationwide service, making sure that everybody has the opportunity of a garden building. We are able to design, manufacture and install our Quality Garden Rooms at any location across the UK. Our Garden Rooms are certain to exceed your initial expectations due to high specification of our products which is accompanied by our friendly and reliable customer service. If you would like to add space or value to your property then a Garden Room makes perfect use of any existing space available within your garden. Cambridge Timber Buildings can provide you with the ultimate solution to transform your garden to be more functional all year round. A Garden Room allows you the opportunity to have a useable Garden Building for an unlimited number of functions to use throughout the year come rain or shine. Whether you are looking to work from home and need a Garden Studio as your office or you have a hobby that requires a working space for your creative outlet or if you are passionate about exercise and need your own personal gym, then a Garden Studio from Cambridge Timber Buildings can give you the space to suit. Depending on your requirements and budget we can design a bespoke building with an array of specifications tailored to meet your needs. A Summerhouse from Cambridge Timber Buildings can provide you with endless options in terms of design and features. Whether you are looking for a traditional or contemporary design, we offer endless options in style and features that will compliment any garden of any size and shape. Not only will it create additional space for you to entertain or simply relax in, it is something that will form a great focal point in any garden. A Garden Workshop is a place to tinker in. If you are keen on DIY or have a creative hobby, having a space to escape to, allowing you the freedom to make a mess away from your homes living areas, is a perfect solution. Cambridge Timber Buildings offer a fully bespoke design service giving you endless options to position windows and doors in the best positions to utilise the natural light and space that suit your needs. The humble Garden Shed is possibly the most quintessential part of any British garden. A Garden Shed can serve as a focal point and is much more than just a place to store garden tools. 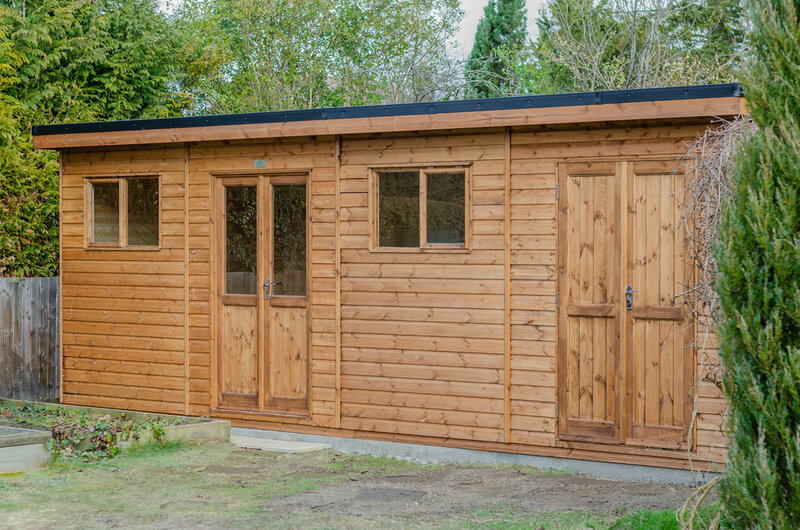 Cambridge Timber Buildings offer a huge range of standard size Garden Sheds, as well as a fully bespoke service giving you the exact size and layout you need. All of our Garden Sheds are crafted with either an Apex or Pent style roof. Cambridge Timber Buildings will work with you to design the perfect Garden Building that caters for your exact requirements. Our bespoke service offers you the flexibility when it comes to exact size, layout or specifications. If you are looking for a Bird Aviary, Dog Kennel, Bicycle Store, Bin Store, Log Store or any Garden Building to suit a specific purpose, then speak to us for a Free design consultation. If you are considering a Garden Building then speak to us in person today on 01353 667268 or email us and we will be happy to provide you with a competitive quote on one of our beautiful Quality Garden Rooms, custom made to your requirements.